Save the date for our upcoming auditions to be part of the 2019 Magic Moments production! Auditions will be on November 3 and 4, 2018 at Waterstone Community Church. We can’t wait to see you there! Tickets are now on sale for this year’s show, In The Same Boat. Sail away with the Magic Moments crew in a nautical adventure set on an ocean liner trapped in the Bermuda Triangle. Missing captains, suspicious passengers, and mysterious happenings abound as the Officers, Crew, and all on board work to find their way back home. Purchase your tickets online now at https://app.arts-people.com/index.php?ticketing=mmi . We will be performing again this year at the Anschutz Family Theater at Kent Denver School, 4000 E Quincy Ave, Englewood, CO 80113. 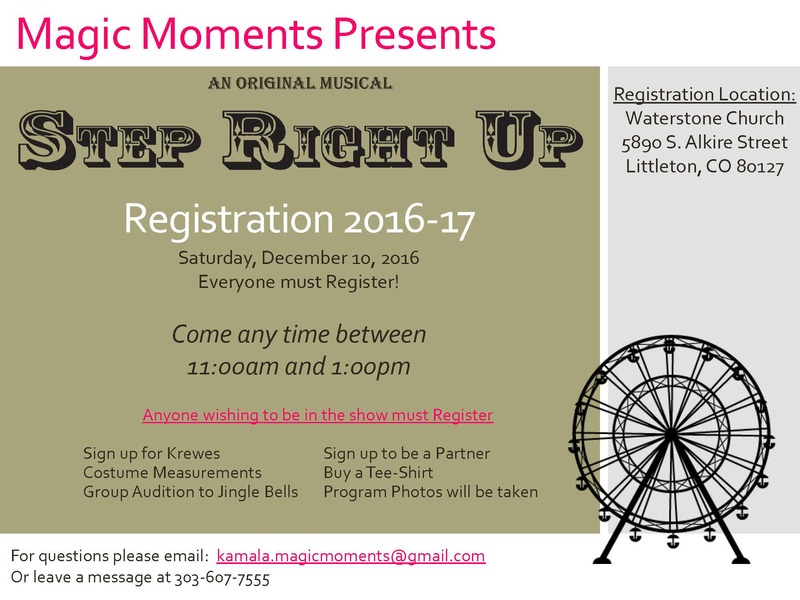 Sign up today to audition for Magic Moments 35th annual production, In the Same Boat. This year’s show, set on a cruise ship lost in the Bermuda Triangle, is destined to be one of the Magic Moments classics! PLUS, as a special nod to our 35th anniversary, we are recruiting cast members past and present to return this year and grace our stage with their talent another time. This is sure to be a Magic Moments reunion you won’t want to miss out on! Auditions are on Saturday, November 4 for adults and teens, and on Sunday, November 5 for kids and take place at Waterstone Community Church – 5890 S Alkire St Littleton, CO 80127. Rehearsals begin Sunday, January 7 and performances are March 22 to 25, 2018. To sign up for your audition, fill in our online form at https://magicmomentsinc.org/cast-and-crew/for-cast/auditions/ . Please send any questions about auditioning, or this year’s show, to auditions.magicmoments@gmail.com. At today’s rehearsal we got in the carnival spirit with a spectacular and fun Pie Throw! Q, our longtime esteemed artistic director, Jonny, our erstwhile music director, and Tony, one of this year’s lead performers, all graciously volunteered their faces as tribute to our pie antics. Relive today’s fun in our videos below, then make sure to head over to https://magicmomentsinc.org/tickets/ and purchase your tickets to the carnival today! A huge Thank You to everyone who has donated to Magic Moments for Colorado Gives. Because of your incredible generosity we have already passed our goal of $6,000!! Now we’re reaching for the stars. Our new goal for the day is to raise $10,000!! We can do it, let’s make magic happen!! Colorado Gives day is coming up soon on December 6th and you can donate to Magic Moments as part of the event. You can schedule your donation now just click on donate and chose “Colorado Gives Day” under Donation Type.